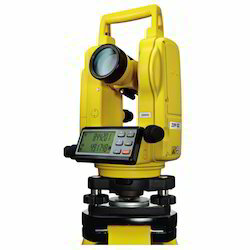 Leading Authorized Wholesale Dealer of prexiso to2 digital electronic theodolite from Ahmedabad. The Prexiso T.O.2 digital electronic theodolite is designed for enhanced reliability in construction applications. Its advanced features let contractors work faster and longer, improving productivity and increasing profitability. With vertical compensation and 2″ accuracy the Prexiso T.O. 2 provides you with the precision required for your most demanding jobs for an affordable price without adding complexity. Various display modes, hold and set zero for horizontal angle, a variation of measurement units, simple distance measurement via stadia lines combined with six function keys guarantee easy use. The visible laser plummet enables you to set up over a point faster and easier than ever. The Prexiso TO 2 Digital Theodolite is the tool of your choice when it comes to checking angles, alignments, grade work and short range levelling. Looking for Prexiso TO2 Digital Electronic Theodolite ?